CU CHI - The Vietnamese Ministry of Defense has only two awards it can present to a United States Military unit - the Cross of Gallantry and the Civil Actions Medal. The 25th Infantry Division now has received both. 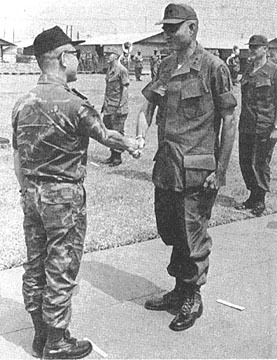 Early this month, Lieutenant General Dow Cow Tri, commanding general of ARVN troops in the III Corps area, presented the Civil Actions Medal for meritorious service to Division commander Major General Harris W. Hollis. The Division had already received the Cross of Gallantry on Jan. 28, 1969, for spearheading 62 major combat operations in its area of operations. The new Civil Actions medal was awarded for the Division's work in Civil Actions, Vietnamization and Pacification programs. "The enemy claims that their Army in the south is like a fish living in water," explained Tri. "But without the support of the population no doubt they soon will be out of the country. This is the reason we want to emphasize Civil Action." "It (Civil Action) is one of the primary planks in our mission," added Hollis, "Pacification is the goal which we all seek. . . . Pacification means peace. "Apart from the fighting which is entailed in war, there must be a healthy base upon which democracy and freedom might flourish in the years ahead." As the pacification program has grown, the government agencies have become stronger, according to Hollis. They have been able to take a greater share of the area defense themselves, he said. The citation accompanying the award referred to specific accomplishments of the Division. It said the 25th "is credited with providing material to build 6,500 houses, distributing 600 tons of food, 50 tons of materials to poor communist refugees and 40,000 toys and many thousands (of) school kits to poor children." In addition it said the Division also has built 18 dispensaries, repaired 140 schools, 100 churches and pagodas, 50 orphanages, 550 kilometers of roads and 50 bridges, conducted 5,934 MEDCAPs which treated 579,621 patients and trained rural medical personnel. The 25th also printed and disseminated 600 million leaflets during 12,000 hours of aerial and ground broadcasts. The Division further was praised for helping train and supply Regional and Popular Forces. By SP4 H. G. ZUKOWSKI JR.
CU CHI - The 2nd Battalion (Mech. 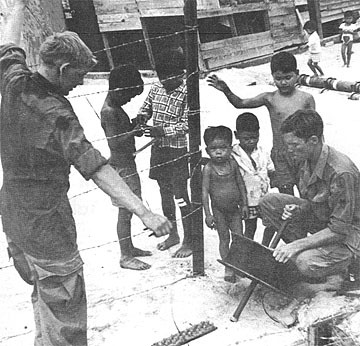 ), 22nd Infantry's Patrol Base Dixon recently was turned over to the ARVN's as part of the Vietnamization Program in the 25th Infantry Division area. 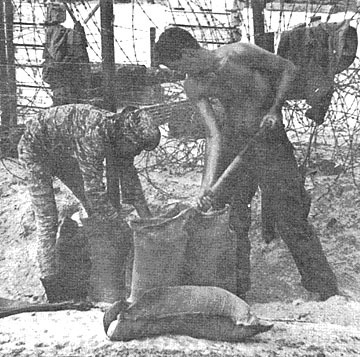 PB Dixon, ten miles west of Cu Chi, was built on the 23rd of December by heavy equipment from the 65th Engineers Battalion along with manpower from Triple Deuce. The Triple Deuce two-month stay at the patrol base was effective in stopping enemy resupply and infiltration through the An Ninh Corridor. A week after the base was completed, men of Bravo Company with local Popular Force soldiers showed the strength and mobility of a mechanized unit killing 27 enemy. They also captured one VC POW, numerous arms, munition, medical and food supplies and one complete 60mm mortar. The action was the largest in the 3rd Brigade area of operation in months. In the month of January the 65th Engineers started clearing the area with rome plows. Destroying thick hedgerows and woodlines around Dixon, left the enemy with little cover and hampered his resupply throughout the area. Triple Deuce security for the plows proved valuable. Significant finds included six captured VC POWs, numerous documents, 15 maibox-type bombs, six 30 pound anti-tank mines and several AK-47 rifles. In February large numbers of caches were found by other Triple Deuce companies working around PB Dixon. In one cache 50,000 piasters, numerous documents, supplies, AK-47 rifles and other small arms were found. Friday the 13th, which was no unlucky day for the Triple Deuce, two munitions caches and a haul of medical supplies were found within a hundred meters of each other. One cache included 357 grenade type booby traps, and one 82mm mortar round. The other, but more vital find, was 1,000 AK rounds, 59 B-40 rockets with 50 boosters, 25 rifle grenades, 2,000 feet of wire, two AK magazines, two wire cutters, three 20 pound anti-tank mines, and three Chicom claymores. Highway 6 1/2 Alfa was a constant threat to U.S. convoys going to Fire Support Base Harris. Triple Deuce moved in and brought a sudden halt to enemy mine and booby trap operations. 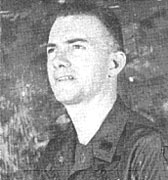 Patrol Base Dixon was named in memory of Specialist 4 Frazier T. Dixon of Clarks Hill, S.C., a member of Bravo Company Triple Deuce, who was killed during operations in the Boi Loi Woods near Tay Ninh. PB Dixon was built on a former site of PB Reed which was used by other Mechanized units. The 3rd Squadron, 4th Cavalry's new 4th Platoon ambush patrol, dubbed the "Night Raiders," have proved their success while on operations in the Boi Loi Woods. On a recent ambush patrol C Troop's 4th Platoon engaged an estimated 6 to 8 man NVA squad, killing 3 of the enemy. Sergeant Eddie Nix, the point man from Edgewood, Tex., explained what happened. "We had left our night laager position, heading for our ambush site when the two of our men decided to check the area with their starlight scopes," Nix said. One of the men, Robert J. Klinger from Pottsville, Pa., told me he saw 6 to 8 NVA. I didn't know if I should believe him, because the night before he identified ten targets that turned out to be water buffalo. "He was given permission to open fire along with one of our other men, Larry Bentley from Wayland, Ky. It looks as if he was right because they killed 3 of the enemy, bringing our total for the month up to 14." In another operation in the Boi Loi Woods, B Troop's ambush patrol killed two more of the elusive enemy. "We had set up our ambush site," said Specialist 4 Kenneth Ingram from Roam, Tenn., the 4th Platoon's machine gunner. "It was about 2:30 in the morning when one of the men spotted 4 enemy soldiers coming our way. We waited until they came right on us, when we blew our claymores and opened fire with everything we had." Suddenly one NVA soldier, apparently confused, ran directly into Private First Class Jerome J. Cherette Jr. from Roger City, Mich.
Cherette engaged him with the long thrust series, hitting him in the face. This startled the enemy soldier even more, causing him to scream out and run in the opposite direction. He only made it a few steps away before he was killed. "The illumination came in," Ingram said, "and when we checked the kill zone there were two NVA soldiers lying there dead. Charlie just doesn't know which way to turn anymore with us out here at nights," Ingram said. A Troop's ambush platoon hadn't got a body count yet, but they were the only ambush platoon that had had two NVA soldiers run right over their M-60 machinegunner, Mark Percosky from Delmont, Calif.
CU CHI - The 3d Battalion, 13th Artillery's ceremony firing the unit's 800,000th round in February was a pretty stuffy affair, according to a warrant officer who served with the unit in 1967 and '68. Chief Warrant Officer 3 James R. Fessenden who is now assigned to HHC 765th Transportation Battalion at Vung Tau remembers the firing of the Clan's 200,000th round. "It was supposed to be the same sort of event as they recently had where the Division commander would give the command and all batteries would fire at once," Fessenden said in a letter to the editor of the Tropic Lightning News. The ceremony was scheduled for the Fourth of July, 1967. 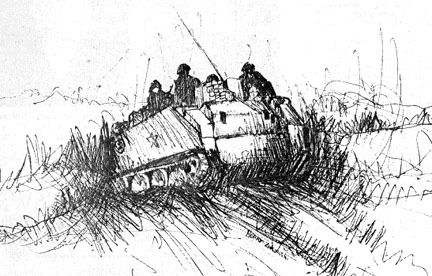 "On the night of 3 July I believe it was the 4/23 (4th Battalion (Mech), 23d Infantry) got into some trouble in the Ho Bo Woods and they called on B Battery for arty support," Fessenden said. "They fired right through the 200,000th round by a couple of hundred rounds before the night was over which sort of messed up the ceremony," he said. CU CHI - The largest amount of money the Army can give to anyone for reenlisting was awarded to a 125th Signal Battalion soldier this month. 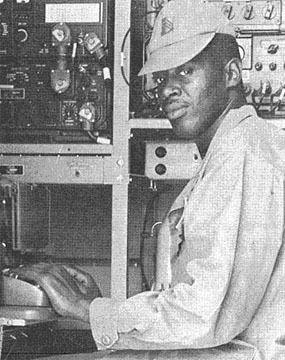 Staff Sergeant Charles Lee Harrison, a radio teletype operator from Birmingham, Ala., reenlisted for $10,000 and a six-year hitch in the Army. "I figure it's worth it," he said. "When I retire from the Army, I'll be trained for a really good civilian job. And I'll get a lot of side benefits now." Harrison was given $3,000 during a brief ceremony in the office of Major General Harris W. Hollis, Division commanding general. He will be given the other $7,000 in a lump sum later so that he may buy a home in the U.S. Besides the money, Harrison will be given a 30-day leave in the U.S. and a three-day, in-country pass. With more than six years already in the Army, Harrison, who is 23, said he plans to make it a career. He pointed out that the Army is training him and that after a full Army career, he still will be young enough to establish a civilian career. CU CHI - There is one way in which Hong Kong greatly differs from other R&R sites for GIs - although Hong Kong is a British Crown Colony, it still is a part of China - and don't forget it. Hong Kong is the last vestige of China which Westerners may visit. At first glance, it may appear to be much like an American city. Although thousands of persons escape from Communist China into the colony each year, there are many persons in Hong Kong who are sympathetic with the Communist Chinese. These people will make the best of opportunities to portray us as "foreign devils." Therefore, soldiers going to Hong Kong should be careful not to become involved in any sort of misconduct. Recently, R&R personnel have become involved in assault and robbery, mass demonstrations and interference with local police. Hong Kong authorities have jurisdiction over military personnel and may send them back to Vietnam or impose a jail sentence of up to three years. Major Charles E. Sites recently assumed command of the 25th Administration Company. He replaced Major Thomas Waller who will be assigned in Germany. Lieutenant Colonel Wallace H. Dawson III is the new commander of the 725th Maintenance Battalion. He replaced Lieutenant Colonel Maxie O. Redic. CU CHI - "Roger. I need to get a message to the men of the 25th Infantry Division. Any and all members of your unit who have relatives or friends within the Ft. Benning or Columbus, Ga., area may call them through MARS." The voice was that of a radio-telephone operator in Ft. Benning, Ga., with a "handle" of Ed. He was talking to the editor of the Tropic Lightning News. The phone patch they used was similar to the one that can be used by any man in Vietnam talking to his friends in the world using the MARS hookup. "On any morning Tuesday through Saturday between 8 and 10 a.m. we will be glad to hook up calls just like this one from Vietnam with any local telephone," Ed said. The MARS station handles between 700 and 900 calls a month, according to Ed. He said contacts have been especially good during the last few weeks and that the station can therefore handle more calls than ever. 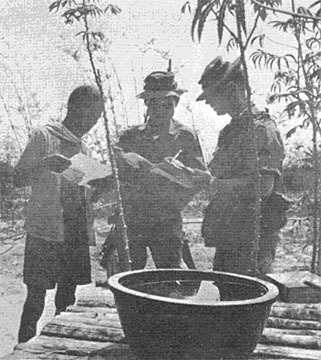 The soldier simply calls CU CHI 5171 or 5172 and asks to have his name put on the list to contact someone in the states. He gives the local MARS station his name and telephone number and the name and phone number of the person he is calling. Then he waits near the telephone until the MARS station calls him back. In the meantime, contact is made with a station like the one at Ft. Benning. That station calls the person the soldier wants to talk to. If the call is long distance, the person being called in the U.S. must pay for the call. The MARS station then calls the soldier and gives him brief instructions. He talks first and says "over" when he is through talking. Then from the states, half way around the world, the voice of his friend will come back to him. Local MARS operators said that contact can be made with almost any number in the United States. Any soldier can use the free service simply by contacting the MARS Station in Cu Chi or Tay Ninh. TAY NINH - Courage and quick reactions combined to make a Tomahawk ambush a success northeast of Fire Support Base Rawlins recently. The ambush patrol, from Bravo Company 4th Battalion (Mech. ), 23rd Infantry, had set out a three man outpost that spotted the enemy approaching their position. 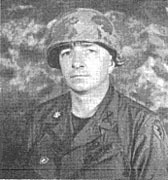 Sergeant Bobby Keeton of Lawrenceburg, Tenn., initiated the Tomahawk firepower, but when he had trouble with his weapon he began feeding ammunition to the M-60 machinegunner. Specialist 4 Chris DeYoung of Chula Vista, Calif., the machinegunner, had to fire at the enemy from a kneeling position. "It was the only way I could get a clear shot at them," said DeYoung. 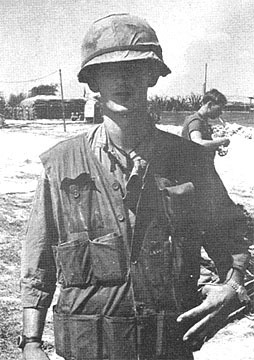 The third man in the outpost was the RTO, Specialist 4 Robert Reimsnyder. Although, seriously wounded, Reimsnyder remained on the radio for thirty minutes to coordinate action between the ambush patrol and a Bravo Company reactionary force. Sergeant George Walker of Manchester, Ky., was the patrol leader. "When we started receiving rocket powered grenade (RPG) fire I moved the patrol about 25 meters to a more secure position," he said. While the rest of the patrol moved to a more secure position, Lee Van Cong, their Kit Carson Scout, remained behind to protect the patrol's flank. He remained in position until the reactionary force from FSB Rawlins arrived on the scene. The arrival of the reactionary force signalled the end of the fighting and a sweep of the area revealed two enemy dead. Two days later, at FSB Rawlins, Brigadier General Michael J. Green presented the Bronze Star Medal to Keeton, Walker, DeYoung and Van Cong. Reimsnyder received the Silver Star Medal in his ward at the 93rd Evacuation Hospital in Long Binh, where he was recovering from his wounds. CU CHI - The enemy fire tore through the helmets of two GI's. The GI's grinned and then opened up on the enemy. Three NVA fell dead in the twilight engagement. There were no U.S. casualties. The reason no friendlies were injured was because the 3rd Platoon, Charlie Company, 2d Battalion, 14th Infantry, used their helmets to decoy the enemy, meanwhile saving their heads to outsmart the Communists. "We came around them (the NVA)," said Staff Sergeant Rodney Namauu, Hilo, Hawaii, third platoon sergeant. "We got them from the rear while they were doing a job on our helmets." The body count was part of five enemy killed in the week's activities that centered mostly north of the "Angel's Wing" portion of the Cambodian-Vietnam boundary and a French-owned sugar mill near the Saigon River. The two additional dead enemy were chalked up by the Combined Reconnaissance and Intelligence Platoon operating in the Rung Long Khanh (Renegade) woods. Though the Golden Dragons operated in an area suspected to hold a regiment of NVA, no friendly casualties were sustained. Elaborate tactics were used to deceive the enemy about the actual whereabouts of the U.S. troops. False evacuations, helicopters picking up bogus troops, and abrupt changes in positions at dusk kept the enemy uneasy in what was earlier his own backyard. Despite the remoteness of the area, hot food was served on most of the afternoons. This was the only relief the Dragon GI's had from otherwise sunscorched days and mosquito-ridden nights with showers about as remote to them as bathtubs. "When this mission is over," said Private First Class Wilson Pagan, Bethlehem, Pa., "I'm going to look like Sergeant Rock without the stripes." The Army and the 25th Infantry Division have a trick up their sleeves for thirsty troops out in the field for an extended period of time - a 100-foot waterfall. The Liquid Free Fall Container, the official Army designation, is designed to be dropped from aircraft at a recommended maximum height of 100 feet. The containers are composed of a seven-ply plastic "water bladder" and an outer cardboard box. The bag is reusable if desired. "We don't drop it per se," said Captain Robert T. Scherfile of Columbus, Ga., S-4, officer for 2d Battalion, 14th Infantry. "But they take some pretty rough handling trying to get them off a slick as quickly as possible." Scherfile added that if they did have to be dropped, which is always a possibility, they could penetrate triple-overhead canopy without being damaged. Every fifteen gallons carried with the Free Fall Containers weighs thirty pounds less than if carried with the old-style portable containers. "The best thing about these three-gallon containers," said Scherfile, "is that when a company's out on a bush (extended operation) a chopper only has to come in once. It doesn't give the enemy a second chance to get himself a chopper when it comes back for the water containers." It doesn't take long for field troops to find one more good point about the containers: the plastic liners can be inflated into a pillow, a luxury you don't even get in a fire support base. 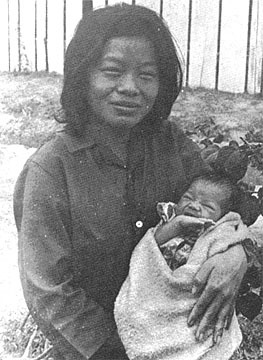 CU CHI - A 19-year old Vietnamese girl was rushed to the 25th Medical Battalion aboard a 159th Dustoff Company helicopter to become the first woman to have had her child at the battalion's dispensary. Mrs. Ong Ba Nguyen Van Sang of Trang Bang, whose husband is an ARVN stationed near Qui Nhon, had been in labor with her first child for two days. The midwife taking care of her finally became frightened because she could not deliver the child. She contacted her village chief who asked the American advisor to call in a dustoff. In the past such emergencies have been handled by 12th Evacuation Hospital or forwarded to Saigon, according to Captain Neil E. Share of Beverly, Mass., the obstetrician at 25th Med who is primarily responsible for the new program. But, he explained, they really did not have the proper facilities. Therefore, after he arrived in Vietnam, Share ordered the necessary equipment and began setting up facilities at 25th Med to help Vietnamese mothers. "She came in shortly after three in the morning," Share said. "Three minutes after they took her off the chopper we were ready to go and the baby was delivered at 17 minutes after three. It was a routine delivery using a local anesthetic." The doctor explained that there had been a minor blockage, easily removed, that might have caused the mother serious injury and could have cost the life of the child without the qualified help of personnel at 25th Med. Share said that from now on, all emergency deliveries from this area will be handled by 25th Med. He added that the dispensary already is providing pre-natal help to 12 Vietnamese women. "What we're trying to do now is spread the word and get the Vietnamese women to come in early so we can give them the proper care," Share said. If the first case was any example, the 25th will not have to look for customers long. Through a translator Mrs. Sang said she liked the care she received and would like to have her next child there if she could. TAY NINH - The Medcap Team of 3d Battalion, 22d Infantry, under the direction of First Lieutenant. Ian Natkin, has been coordinating closely with SGT Phan Van Tien in an attempt to Vietnamize the program. Tien, an ARVN Regular, has been trained by the Americans. His relationship with the people is very similar to that of an American country doctor, Natkin said. His transportation, supplies and calls are arranged by the Medcap of 3d Battalion, 22d Infantry. Although the program is not at full strength yet, the people respond much better to the Vietnamese Medics, according to Natkin. 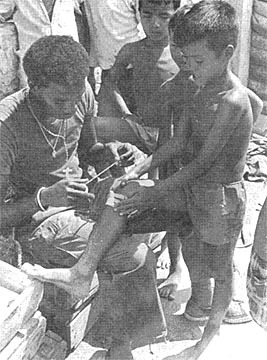 As a result, they confide in the ARVN Medic and more health problems are brought to the surface and recognized as major or minor problems within the hamlet. "The program has proved helpful in many ways," Natkin said. It is a definite step toward Vietnamization. It enables us to help the people in a direct way, and it helps to infiltrate the hostile villages. The Medcap is undoubtedly one of our most effective weapons." A huge C-130 transport plane swallows three 105 Howitzers to transport them within range of an infantry operation near Thien Ngon Special Forces Camp. TAY NINH - One of the most important jobs of an artillery unit is to provide timely, accurate fire support for infantry operations. Because of the limited range of an artillery piece, they must be mobile enough to follow the bluelegs on long range operations. Bravo Battery, 7/11 Arty, recently demonstrated the capabilities of a 105mm howitzer battery when they were airlifted by C-130 cargo planes to the Special Forces Camp at Thien Ngon. 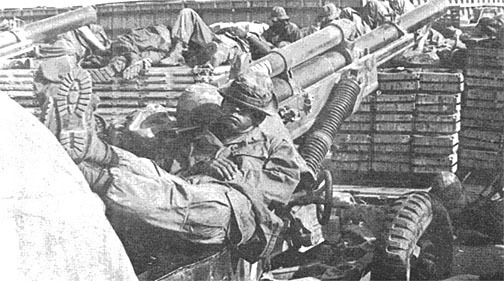 The move enabled the flying cannoneers to support the Regulars of 3/22 Infantry and the Civilian Irregular Defense Group at Thien Ngon, who teamed up for a six day operation in the "Elephant's Ear." 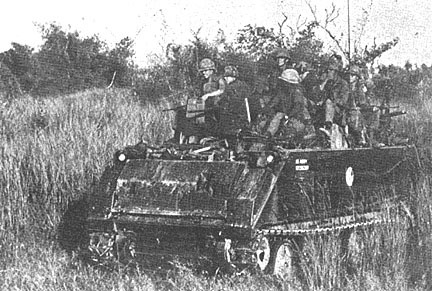 For the first leg of their journey, Battling Bravo convoyed from Fire Support Base Buell to Tay Ninh Base Camp. 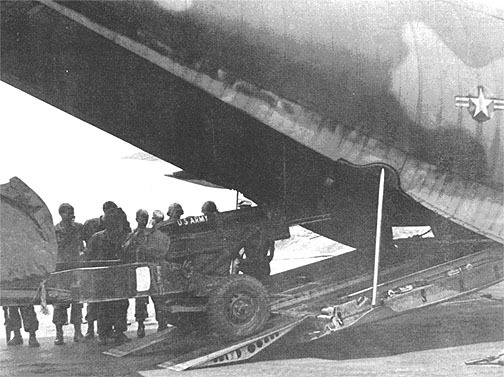 There they loaded everything on the C-130's which flew them to Thien Ngon. When the battery arrived at the Special Forces Camp, the day's work had only begun. They still had to move into position, lay the guns, break out ammo, and set up the Fire Direction Center before they were ready to fire. As soon as they were set up, the hustling cannoneers started "prepping" landing zones for "Eagle Flights." It didn't take the bluelegs long to find the enemy. They made contact while moving into night AP's. But heavy artillery fire sent the NVA scurrying for Cambodia. Before they could reach the border, friendly forces made contact twice more in skirmishes that left 9 NVA dead. When the operation was complete, the traveling cannoneers packed up all their equipment and caught C-130's back to Tay Ninh. Artillerymen of the B Battery, 7/11 Artillery, string wire around newly constructed positions dug after they moved their 105 Howitzers to support infantry units. 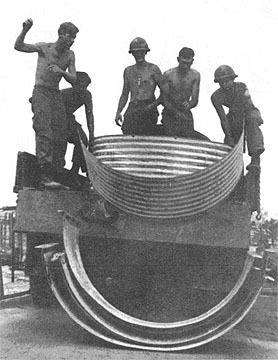 Cannoneers unload culverts for building temporary personnel bunkers after the 7/11 Artillery transferred some of its guns to support an infantry operation. Artillerymen from the B Battery, 7/11 Arty, dig in after shifting their guns to Thien Ngon Special Forces Camp to support leg units in a six-day operation. A 7/11 artilleryman gets a moment of respite during a shift of fire power to support distant leg units. FSB PERSHING - Most combat infantrymen fighting in Vietnam really don't worry too much if their wearing apparel isn't in step with the latest fashions. One exception, however, is Sergeant James J. Ross, who just might be a winner in the Army's Suggestion Program. Ross now qualifies as one of the best-dressed Warriors of the 2nd Battalion, 12th Infantry, with a coat he fashioned for himself. Ross's coat of many pockets is truly a unique garb to say the least. It features 24 large pockets for M-16 magazines and a pouch on the back to port a Claymore mine. "I scrounged up the canvas material," Ross said. "I gave the measurements to our interpreter and he gave the specifications to a civilian tailor who made up the jacket for me. "It's really great to have on an operation," Ross said. Other Warriors are following suit. "A few others in my platoon have had them made too," said the functionally, if not fashionably dressed, Warrior sergeant. Although enemy mortar teams occasionally succeed in dropping rounds into an allied base, US artillery is making it extremely difficult for the enemy to accomplish his mission. Just getting set up within range of a target is a long, hard job. Enemy mortar tubes and ammunition are usually carried long distances and the trick is to make it without being detected. Movement during the day is next to impossible, and even at night the enemy runs the risk of walking into an ambush or being picked up on allied detection equipment. Any time Charlie comes out of hiding, he is likely to be greeted with a volley of artillery rounds. When the enemy finally gets into position, he knows that he has to fire his rounds quickly and get away before he is located and artillery starts "dropping the world in on him." Recently an enemy mortar team, who fired at FSB Washington, was surprised by the quick reactions of the "On Time" cannoneers from 7/11 Artillery. In their haste to escape counter-fire from the Arty, the communists left behind three 82mm mortar rounds and some personal equipment. The evidence was found by Major Uri French, Operations Officer for 7/11 Arty, who flies every morning on a visual reconnaissance of the area around Tay Ninh Base Camp. Major French spotted the camouflaged mortar position from his LOH aircraft and ordered his pilot to land for closer inspection. A search of the position turned up the hastily abandoned equipment. Although the enemy mortarmen escaped, they lost a good mortar position and some equipment which represented a lot of work. But they also gained something from the encounter - a healthy respect for the speed and accuracy of 7/11 Arty. Delta Troop's Mini Cav of 3rd Squadron, 4th Cavalry, located a 7,000-pound rice cache recently while on operations in the Ho Bo Woods. "Acting on an intelligence report," said First Lieutenant David W. Carraway, the Mini Cav's team leader, from Philadelphia, Pa., "We were inserted about 2 miles southeast of Fire Support Base Pershing. We had with us a Hoi Chanh that claimed he had knowledge of where a lot of rice was hidden. "We had walked for about 30 minutes when the Hoi Chanh pointed out a place in a hedgerow. We investigated it and found a hole containing about 1,400 pounds of rice. This was a pretty good haul of rice. "Thinking this was all, the Hoi Chanh led us about 150 meters away to another hole lined with tin, plastic and straw where we found an additional 1,400 pounds of rice. "From there he led us to three more which contained about the same amount of rice in each of them, giving us a total of about 7,000 pounds," said Carraway. "That ought to make Charlie's mouth water." DEAR SERGEANT CERTAIN: I'm a little hesitant about bringing this question to you since my mother always accused me of being a complainer, but I decided I'd better do it anyway. A while back, I tried to get on a flight to Tay Ninh from the 8th Aerial Fort in Cu Chi, but I didn't have my orders with me so the clerk told me to have a seat in the lobby. That was three months ago and now I'm getting short. What do you suggest I do? DEAR FEET: It wouldn't seem to me that your feet are the problem. I suggest that you take a brief leave of absence from your position, and hitch-hike to your local PX. Buy yourself a pillow, some magazines and maybe a few books. Return to the airport and enjoy the rest of your Vietnam tour. DEAR SERGEANT CERTAIN: As company mess steward I sometimes hear complaints about our superior food and service. Could you suggest something to make the men happier with my mess hall? DEAR MESS: Possibly the problem is that the mess hall doesn't have the warmth of Ma's kitchen back home. Try putting up yellow ruffled curtains and piping in the sound of children fighting and babies crying. Write each GI's name on his mug. Ask about their favorite foods and surprise them on their birthdays. When they come into the mess hall, tell them how nice they look and how glad you are to see them. I'm sure you will find that these suggestion will get results. SETTING UP AMBUSHES - Members of the 1st Battalion (Mech), 5th Infantry return to the perimeter after delivering members of the 2d Battalion, 14th Infantry, to their night ambush site. Combine a mechanized unit and a leg unit in the Hobo Woods and what do you get? A night-laager, NVA-eliminator of course. The 2d Battalion, 14th Infantry, and the 1st Battalion (Mech), 5th Infantry made just such a combination, resulting in a deadly twosome for the enemy. The operation, just north of the Saigon River, kept the NVA running during the day with long-range track sweeps. Night time didn't offer a chance to sleep for the communists because of numerous Dragon ambush patrols. 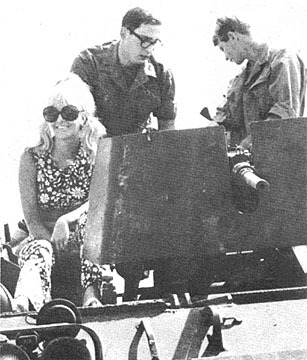 Alfa Company of the Golden Dragons spent 14 days on the joint mission netting many captured and killed NVA. Many more were left without a place to hide. 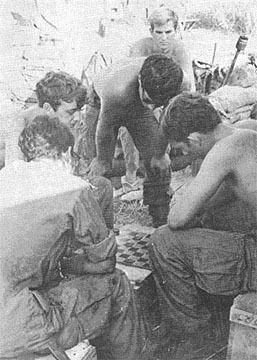 JUMP, JUMP, JUMP - Between night ambushes, troops of Alfa Company, Golden Dragons, pass the daylight hours with a lively checker game. MOONLIGHTERS - Waiting for the enemy, men of the 2d Battalion, 14th Infantry, and the 1st Battalion, (Mech), 5th Infantry, man a night ambush. WINK STOVE - A soda can and a heating tablet are used to cook a noon snack of C-Ration stew by this Golden Dragon between night ambush operations. CATCHING A RIDE - Golden Dragons catch a ride to ambush site during combined operations with the 1st Battalion (Mech), 5th Infantry. PHUOC LUU - If Specialist 4 Wendell C. Simms of Los Angeles, Calif., a medic from Delta Company, 2nd Battalion, 27th Infantry Wolfhounds, ever decided to run for mayor of Phuoc Luu village, he probably would win hands down. The popularity of Simms, as he is affectionately known by most people in the village, especially the children, began over a month ago when Delta Company moved to Phuoc Luu and set up their operations inside the village. They came to him slowly at first, then gradually more and more until every day villagers were coming to "Doe" Simms for treatment. They came with everything from children who had been burned to a woman who had had a miscarriage and was hemorrhaging - from victims of booby traps to villagers with 105-degree temperatures. Simms treated and earned the respect of just about everyone at Phuoc Luu. Then on the night of Feb. 8 the presence of Simms and all the members of Delta Company and their concern for other people became a reality to the entire village. After an electrical storm had accidentally detonated three claymore mines set out to protect a P.F. compound in the middle of the village, the call for help went out. In response to this call several men from Delta Company went into the dark and rain-soaked streets and, in spite of the fact that other claymores nearby might go off at any time, began carrying the victims to Delta's command post. Once the victims were inside, Simms encountered the problem of separating the critically wounded from the less seriously wounded as about thirty of the villagers, in the mist of hysteria and confusion, tried to crowd into the tiny C.P. There were no lights to aid in the treatment of the injured and by the time the Dust-Offs had taken the last victims to the hospital, all of Delta Company's medical supplies had been depleted. When everything was over, five of the village children had been killed and 12 people were injured. About seventy-five percent of the casualties were under thirteen. Simms was put in for the Bronze Star for Meritorious Service for his outstanding service to the people of Phuoc Luu. There are many ways to fight a war like the one in Vietnam. You can use bombs, psychology, rehabilitation or the new approach - Viet Cong Infrastructure. It involves going to the home of the enemy and asking where he can be found. The 2d Battalion, 14th Infantry, Intelligence Section, headed by Captain William Branch, Barnsville, Ga,., is using just this type operation. "What we do," said Branch, "is go to a known VC village and just start asking the people questions. It works. We've picked up several pieces of information." When asked if he termed the information important he answered, "In intelligence everything's important." The operation involves three teams including security elements. Included is one national policeman for each group to provide authority, and one interpreter. "On our last two operations," said Branch, "we used a new twist. We picked up some Chieu Hoi's (Hoi Chanhs) and took these people with us. They sat down and talked with the people in their homes and told the people why they rallied." The official designation of this type operation is an Armed Propaganda Team. "The whole idea of the operation is to keep it Vietnamized as much as we can," said Branch. The Golden Dragons recently changed their area of operations and so the full effect of the program where it was initiated could not be determined. But just the sight of government and U.S. soldiers ready to sit down and talk with families of the enemy about their problems could not have gone unnoticed. BAO TRAI - The people of Hau Nghia province are getting advanced medical care thanks to the Philippine Civic Action Group (PHILCAG) Hospital in Bao Trai. Established in 1967, the hospital is staffed by Filipino Army doctors and technicians. There are also Vietnamese nurses on hand to interpret and help care for the patients. "I treat on the average of 150 patients a day," said Doctor (Captain) Edilberto E. Gamboa, the group's executive officer. "We also treat Hoi Chanhs and detainees. Many of these people have never seen a doctor and there is a lot of malaria," explained Gamboa. 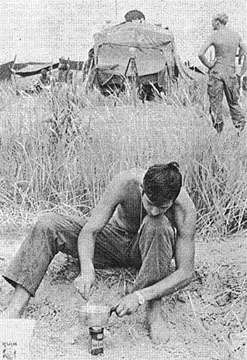 Filipino personnel spend a year in Vietnam. The hospital staff is staggered at six-month intervals so at least half of the doctors and technicians working at any time are experienced in working with the Vietnamese. For patients who need medication, there is a dispensary. The medicine is supplied by the United States Agency for International Development (USAID), a civilian organization that works primarily in underdeveloped areas with the help of military liaisons. Doctor (Captain) Lorenzo B. Guinto is the group's dentist. "Many of these people have teeth problems because of a lack of toothpaste," said Guinto. Part of the dental facilities are mobile and are taken on MEDCAPs which the group conducts weekly. Two wards, each having 12 beds, are located in the hospital. One is for civilians and the other is for military. Vietnamese doctors usually care for the military patients. An operating room is available for light surgery but more complicated cases are flown to either Cu Chi or Saigon. It's not very often when personnel of the 3d Brigade Headquarters Company can all take part in a pacification project. So when the opportunity recently was presented to the men, they grabbed at the chance. It seems one of the company's civilian workers, Mrs. Duon Thi Mat, was in need of an operation to relieve severe pain in her right eye. Mrs. Mat, 25-year old widow of a 46th ARVN Regiment platoon leader, had lost the sight of the eye. This came as a result of tissue deterioration from a mysterious infection which befell her two years ago. The most the U.S. Army could do was to perform an operation to remove the inflamed tissue and fill the resulting void with an artificial eve. A private operation in Saigon would be necessary to make it look cosmetically like her other eye. Here's where the company came to the rescue. Mrs. Mat, mother of a 3-year old son, makes only 110 piasters a day. The private operation would cost 40,000 piasters, far more than she could ever hope to raise. But with the combined efforts of Captain Frank E. Smith, company CO, and the brigade S-5 office, a fund was established to raise the needed amount. "The response by the men was overwhelming," said a beaming Smith, proudly. Within two hours on payday morning more than enough money was raised. "This was the first time the entire Headquarters Company has been involved in a civic action project," Smith, of Arlington, Tex., added. "We certainly intend to keep these projects going as it seems to be an excellent method of pacification." Should the operations prove successful, and medical authorities expect they will be, Mrs. Mat will be able to enjoy a better life. She speaks English very well and has had two years of nurse's training. Without the handicap of constant pain, she will be able to do hospital work and thus make more money to support herself and her son.